Feeling isolated can exacerbate anxiousness—Here are two MBSR practices to help you get back in touch with the emerging moment, in touch with yourself, and with other people. Feelings of being separate, disconnected, or, worse, unsupported, can all too easily snowball into anxiety, complete with all of the unpleasant symptoms anxiety can bring. A participant in a Mindfulness-Based Stress Reduction (MBSR) class once described this as feeling like she was in a bubble while the rest of the world was connected. She said she felt invisible, removed, and alone, and that it was gradually deepening her despair and a sense that she was different from everyone else and could never fit in. Perhaps you also have experienced this. The truth is, we all have moments when we feel isolated and painfully separate and long to experience our integral unity with life. We all have moments when we feel isolated and painfully separate and long to experience our integral unity with life. Mindfulness practice allows a different perspective and supports you in seeing what’s actually happening. When you pause and recognize thoughts as just thoughts, emotions as just emotions, and sensations as bodily experiences, you develop a great sense of connection. While your present-moment experience may not be comfortable, you are in touch with the emerging moment, in touch with yourself, and quite possibly more in touch with other people. As your practice of mindfulness deepens, your sense of connection will gradually increase, easing your access to your deepest strengths and resources and to the whole of your life and the world. Here’s an informal practice that you can do in the moment as soon as you recognize that you’re feeling separate. There’s no need to wait until you feel pain or a strong sense of disconnection; use it as soon as you have the sense that you’d like to feel more connected. You can do this practice in any position: lying down, sitting, or standing. One key way in which it differs from other practices is that your eyes remain open and engaged with your surroundings. First, deepen your awareness of your entire body. You might become aware of points of contact with the chair or surface beneath you, a sense of weight as you rest in the security of gravity, or a feeling of how you fully inhabit three dimensions through the length, width, and depth of your body. Pause here and invite a softening of any tension, perhaps in the belly, jaw, corners of the eyes, or hands. Allow your vision to expand, deliberately softening your gaze and widening the lens of your perception to take in your entire field of vision. Also connect with your breath and your heart, softening through your chest, being present, and actively bringing kindness to yourself. Next, engage your visual field and body awareness together. Open your peripheral vision so you can be aware of your hands on your lap or more fully sense your entire body, perhaps your torso, thighs, or the width of your shoulders. Allow this sensory experience to extend to what you can see: light, colors, and shapes both in the foreground and the background, taking in the experience of being a part of the world. You might also expand to other senses, perhaps including smells and sounds as well. Allow yourself to become part of the fabric of the moment, seeing yourself in the wider field of your surroundings, hearing the sounds around you, feeling sensations in your body, and gently acknowledging any thoughts and feelings you find. Hold all of this spacious, open-eyed awareness. While your present-moment experience may not be comfortable, you are in touch with the emerging moment, in touch with yourself, and quite possibly more in touch with other people. Sensing yourself within the wider field of your surroundings is a practice that can broaden limitlessly as, throughout your day, you attend to the web of life that you’re a part of and share with all living beings, all interconnected and interdependent. When you deeply reflect on the ripples of interconnection that pulse through your life, you can directly experience how you are never isolated. Everything in your life, from the food you eat to the furniture around you, connects you to the lives of others. We are all connected to our planet, nourished by its water and air. We are all connected to the sun, which supports all life on this planet. You exist within vibrating patterns of connection, which you will readily sense if you pause in any moment to feel your feet firmly planted on the earth, to receive the sun’s warmth on your skin, to refresh yourself with a drink of water, and to sense how the flow of air as you breathe connects you with all of the life around you. Being in nature and making time to experience and honor the natural elements of this world can provide a powerful reminder of the deep interconnection you have with this planet and all of its beings. Recognizing the forces of light and dark, gravity, weight, sunshine and moonlight, the cycles of seasons and weather—in short, the simple realities that unite us all—can be such a profound affirmation of everything you share with others and all of the ways in which you belong. When you deeply reflect on the ripples of interconnection that pulse through your life, you can directly experience how you are never isolated. At times, it may also be helpful to recall the many ways in which you’re connected with other people. For one, you’re part of a network of millions of people around the globe who practice mindfulness. Whenever you take time to sit for meditation, practice the body scan, or engage in mindful movement, you join countless others who are also practicing at the very same time. While you may never meet these people in person, you enter into a global community of individuals making the choice to live with intention and become intimate with life in all of its vibrancy and interdependence. Remembering your place in this community of practice, as well as your place in the human family and on this planet, you may choose to send kind wishes to yourself and others, and you may choose to open to receive the kind wishes of others. Mindfulness is sometimes known as heartfulness, and this speaks to how the practice is both personally and interpersonally unifying. At any time, recalling this unity can break through feelings of disconnectedness or isolation, bringing a sense of interconnection that can suffuse you, like the sun emerging from a cover of clouds. This meditation will help strengthen your sense of interconnection. Read through the entire script first to familiarize yourself with the practice, then do the practice, referring back to the text as needed and pausing briefly after each paragraph. Set aside about twenty minutes for this practice. You can do it in a seated position, standing, or even lying down. Choose a position in which you can be comfortable and alert. Pause to check in. Begin by taking a few moments to check in with yourself and acknowledge how you’re feeling physically, mentally, and emotionally. Whatever you find, allow it and let it all be. Now gently shift awareness to breathing. Be aware of breathing in and out, tuning in to one inhalation and one exhalation at a time. There’s no need to manipulate your breath in any way; just breathe in and out normally and naturally. Try to focus on your breath wherever you feel it most distinctly. It could be at the tip of your nose, in your nostrils, or on your upper lip. You might feel it more prominently in your chest or belly or somewhere else. Wherever you feel your breath, let your awareness rest there…being mindful of breathing in and out. Now begin to feel the connection of your body. Feel the surface supporting you. Then feel how that surface is connected to the floor, which is connected to the building you’re in, which is connected to the earth. Sense into this earth that holds you and allow yourself to be supported by it. Reflect on how this earth holds all beings, whether small or large, forsaking none. Reflect on how you’re in a safe place and there’s nothing more you need to do—nowhere you have to go, and no one you have to be. Just allow yourself to be held in the heart of the earth with kindness and ease. Now let your awareness expand. Sense the connection of the earth to the solar system and beyond, to the vast universe. In this way, we all are interconnected. Our bodies, the earth, and the stars—all are composed of the same matter. All are made up of the same basic particles, just joined in different and ever-changing ways. May you open to feeling at home within your body and mind with a true sense of belonging, connection, and interconnection. Pause to feel into and relish the grace of this universe. Appreciate that you are an intrinsic part of it and can never be separated from it…feeling a sense of connection and interconnection as you are at home within your being. There’s nothing you need to do and nothing to be pushed away…you are simply resting in the heart of this universe just as you are. Now gradually return awareness to your breath. Feel how your entire body breathes in and out, from head to toe to fingertip, unified, connected, and whole. May all beings find the gateways into their hearts. May all beings feel at home within the world and universe. Right after your first practice of interconnection meditation, take a few moments to write about your experience. How did it go for you? How did you work with what came up within your body, thoughts, and emotions? And how are you feeling right now? 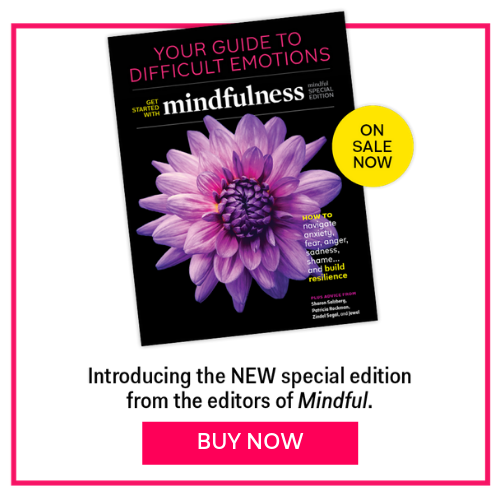 This web extra provides additional information related to a feature article titled, “The 8-Week Journey to Now,” which appeared in the August 2017 issue of Mindful magazine.